Minnesota protest says ‘no’ to military at the border, ‘yes’ to asylum for migrants | Fight Back! Minneapolis, MN - More than 50 people gathered November 5 at rush hour to protest on the Lake Street/Marshall Avenue bridge, a major artery that connects Minneapolis and Saint Paul, to protest President Trump’s relentless racist attacks on the caravan of refugees heading north. The refugees are seeking asylum from rampant violence, political instability and extreme poverty in Honduras. The protesters carried signs opposing President Trump’s plan to send thousands of military troops to the border and his threats to fire on asylum seekers, as well as signs in solidarity with the thousands of Hondurans who will seek asylum in the U.S., as is their right under international and U.S. law. The protest was called just two days earlier by an ad hoc coalition of immigrant rights, anti-war and Latin American solidarity organizations. The ad hoc coalition has brought together Minnesota Hands Off Honduras Committee, the Minnesota Immigrant Rights Action Committee, Minnesota Cuba Committee, Haiti Justice Committee of Minnesota, Puerto Ricans in Minnesota, Women Against Military Madness, and many others. President Trump and Republican candidates from the national to the local levels have tried to demonize the people fleeing Honduras, one of the most violent countries in the world. The departure of thousands of people from Honduras is a direct result of U.S. military intervention in Honduras since the 1980s, the U.S.-backed coup against the Honduran government in 2009 and more recently, the highly irregular Honduran presidential election last year. These events have created an unstable environment in Honduras with extreme economic difficulties and rampant street violence. As many people leave Honduras for their own safety, Trump and his followers are trying to trick people in the U.S. into thinking that everyday working people fleeing for their lives are somehow a threat. Trump’s rhetoric bashing the caravan got more shrill as the midterm election got closer, showing it was part of an electoral strategy. But it was also consistent with Trump’s vitriolic approach to immigrants since before he was a candidate and is part of an ongoing anti-immigrant approach, not just something aimed at the midterm elections. As part of Trump’s escalation, on October 29, he ordered over 5000 U.S. troops to further militarize the Mexico-U.S. border. 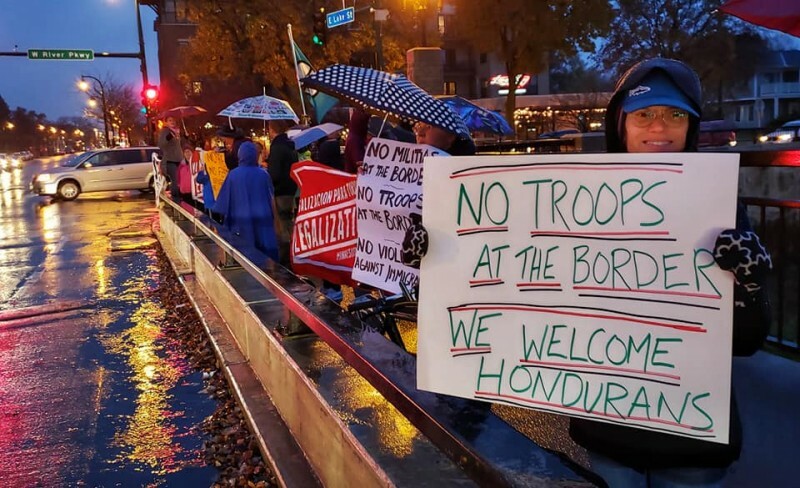 The ad hoc coalition will have more upcoming actions to oppose U.S. military troops being sent to the border and to support asylum seekers from Honduras and elsewhere in Central America and México.